The government has notified the controversial anti-avoidance tax rules, which will be implemented from April 2016 and apply to business arrangements with a tax benefit exceeding Rs 3 crore. Power Minister Jyotiraditya Scindia today said his ministry has sought a Cabinet approval for the gas pooling policy and it would also be looking at a clearance for capping the price of gas for the power sector at $5 per mmBtu. Online commerce major eBay Inc has agreed to acquire payment platform Braintree for about $800 million in cash in order to strengthen its PayPal business. Braintree will continue to operate as a separate service within PayPal under the continued leadership of Braintree CEO Bill Ready, eBay said. Amid talk of Reliance Industries being denied a higher price for gas due to output from KG-D6 not matching targets, Oil Minister M Veerappa Moily today said the new gas pricing policy will apply uniformly to all. The CBI is looking into alleged irregularities at the National Spot Exchange Ltd (NSEL), Finance Minister P Chidambaram said today, indicating the agency may take appropriate action. Targeting camera aficionados, Nokia India today unveiled its much-anticipated 41 megapixel camera phone Lumia 1020, which will hit shelves on October 11. The price of the device will be disclosed on October 10 but as per estimates, it will be available in the range of Rs 47,000-Rs 48,000. It is currently selling in other markets for $800. AirAsia India today announced it has received the crucial 'No Objection Certificate' from the Civil Aviation Ministry, with the Malaysian parent company's chief Tony Fernandes terming the development as "very exciting". The General Anti Avoidance Rules (GAAR) provisions will come into force from April 1, 2016, the Central Board of Direct Taxes (CBDT) said in a notification dated September 23. The GAAR provisions were introduced in the 2012-13 Budget by then Finance Minister Pranab Mukherjee to check tax avoidance and were to have come into effect from April 1, 2014. The proposal generated controversy, with investors apprehensive about harassment by tax authorities. To soothe the nerves of jittery investors, Finance Minister P Chidambaram in January announced the postponement of the implementation of Chapter 10A of the Income-Tax Act (dealing with GAAR) by two years to April 1, 2016. According to the notification, GAAR would be applicable to foreign institutional investors that have not taken the benefit of an agreement under Section 90 or Section 90A of the I-T Act or Double Taxation Avoidance Agreement (DTAA). The GAAR provisions would not apply to business arrangements where the "tax benefit in the relevant assessment year arising, in aggregate, to all parties to the arrangement does not exceed a sum of Rs 3 crore." The notification said investments made by a non-resident through foreign institutional investors (FIIs) would not be covered by the GAAR provisions. "Stock markets will have a lot to cheer as FIIs which do not seek to avail of treaty benefits will not be subjected to GAAR. Similarly, investment in participatory notes will not be subject to GAAR," Deloitte Haskins & Sells Partner NC Hegde said. Investments made before August 30, 2010, would be spared from the GAAR net, according to the notification. Addressing the media here, he said the Power Ministry would also seek the Cabinet nod to grant independent regulatory authority status for Power System Operation Corporation Ltd (POSOCO). Currently, POSOCO is a wholly owned subsidiary of Power Grid Corporation of India (PGCIL). Looking to insulate power producers from higher gas price by seeking a subsidy from the Ministry of Finance under the proposed policy, Scindia said, "We will soon approach the Cabinet for fixing the price of gas at $5 per mmBtu (Million Metric British thermal unit) for the power sector". His ministry had opposed higher price for domestic gas when the Cabinet Committee on Economic Affairs approved the Rangarajan formula that worked out to a gas price of $8.4 a million British thermal unit in April 2014. 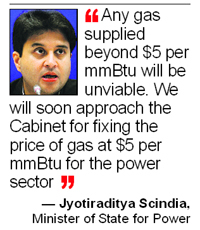 Scindia said the power sector could absorb a gas price of $5. “Any gas supplied beyond $5 will be unviable,” he said adding the government has made it clear that any additional gas produced in the country will be diverted to the power sector after meeting the requirement of urea plants. Last month, the minister had said that power projects would get the surplus gas until March 2016, after which the situation will be reviewed again. The decision would benefit projects with a combined capacity of over 7,800 MW, he had added. The power ministry is seeking Rs 11,000-crore subsidy payout to cover the cost of hiked electricity tariffs. Gas pooling would help in getting stranded gas capacity of about 18,000 mw of the ground. It is seeking parity for electricity utilities with fertiliser units in the allocation of gas after a drop in output from RIL’s KG-D6 block led to reduced domestic supplies. In March this year, electricity generating stations stopped getting gas from KG-D6. Scindia said he was also moving the Cabinet for a granting independence to POSOCO, a subsidiary of Power Grid Corporation. The Power Minister also said the Government was considering extension of financial restructuring programme (FRP) for state electricity distribution utilities (Discoms) of four more states - Jharkhand, Bihar, Andhra Pradesh and Karnataka. PayPal is eBay's payment platform that enables global commerce, processing more than 7.7 million payments every day. "Braintree is a perfect fit with PayPal," eBay president and CEO John Donahoe said. Braintree's management team and employees are expected to stay in place, the statement said. Braintree, that has over 180 employees, help online and mobile businesses around the world accept credit card payments by providing a merchant account, payment gateway, recurring billing and credit card storage. Its mobile app, Venmo, which is also part of the deal, gives people a way to pay using their mobile devices. "Together, we expect that PayPal and Braintree also will accelerate our leadership in supporting developers who are creating innovative solutions for next generation commerce startups," Donahoe said. "There are no grey areas. The policy which we have adopted (based) on the recommendation of the Rangarajan Committee will be applicable to everyone," he told reporters on sidelines of the Global HSE Conference organised by Cairn India here. Asked if the new price of about $8.4 per million British thermal unit will not apply to RIL's currently producing D1&D3 fields that have produced much less than target, he said, "Don't ask (me that). When I said (price will apply uniformly) did I qualify." Pressed further if the pricing of gas based on the average of rates at international hubs and actual cost of imported LNG would apply to all domestic producers uniformly, Moily said: "Yes". "A complaint has been received by the CBI of violations of the Indian Penal Code and some other laws. The CBI is looking into that complaint and they will decide what further action needs to be taken on the complaint," he told reporters. Chidambaram said three authorities — the CBI, the Forward Markets Commission (FMC) and the Ministry of Corporate Affairs (MCA) — are looking into the payment crisis at the commodity exchange, as per recommendations of the high-level committee headed by Economic Affairs Secretary Arvind Mayaram. "I cannot possibly give a timeline for when each of these authorities will take action, but from what I have gathered, each of these authorities will take action as early as possible...They have listed out the irregularities," he said. NSEL, a part of the Jignesh Shah-led Financial Technologies (FTIL) group, is grappling with a Rs 5,600 crore payment crisis after it had to suspend trading on July 31 after a government directive. It has defaulted on six consecutive weekly payments to its investors. NSEL was not a registered or recognised association under the FMC and got exemption even before it started its business, Chidambaram said, adding investors who put in money in the exchange knew it was an unregulated entity. "I think there is much more to the way NSEL started business than meets the eye. People seem to have given money to NSEL promoters with open eyes that it is not a regulated entity, that is violating conditions from day one. Yet they were giving money to NSEL. Many of them made money in initial stages and some of them lost money now," he said. "We have received extremely encouraging response for our Lumia range and believe that Nokia 1020 will further strengthen our leadership in imaging, which plays a important role in the lives of consumers today," Nokia India MD P Balaji said. The dual-capture feature of the phone allows to take a high resolution 38 megapixel image and also creates a 5 megapixel picture that can be shared on social networking sites. The device has an application called Nokia Pro Camera, which makes it easy for anybody to take professional quality images. Though NOC was issued by the Ministry last week, this was the first formal statement by the AirAsia CEO on microblogging site Twitter. "I am thrilled to announce that AirAsia India has received NOC from the Government of India. Very exciting and hugely profitable," Fernandes said in a tweet. With the NOC in hand, AirAsia India would now have to apply to the Directorate-General of Civil Aviation (DGCA) for its Scheduled Operator's Permit (SOP or the flying permit), which is the final step before it can start its flight operations. The DGCA grants the SOP after vetting the preparations of a start-up airline to launch flights by examining issues like availability of aircraft, manpower to operate flights as well as on the ground, aircraft parking space at airports and engineering facilities.